Whether you are in search of a professional company that is able to install gutters on your new home or you are looking to replace your old gutters, Gut-R-Dun can offer you a complete range of exterior services in Penticton. Our area of expertise includes eavestrough installation and replacement, as well as seamless gutter maintenance and repair. What makes us different from the rest of the companies in our domain is that we spare no effort in our work so that you can benefit from top quality. We don’t use the cheapest materials because we believe that quality is more affordable on the long term. 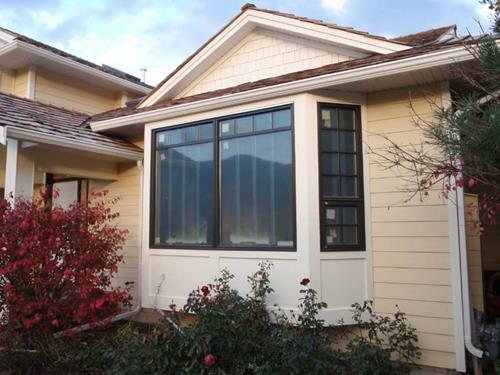 Instead of using materials that will cause your Penticton gutters and downpipes to break twice a year, we select only materials of the highest quality to make sure that you don’t end up spending a small fortune on gutter repairs. The secret to our excellent services is that we collaborate with the top suppliers in Canada and our gutter installation experts are people who strive to achieve perfection in what they do and are willing to go the extra mile to make sure that you are left with an impeccable gutter system. What kind of installation/replacement services we can provide you with? There are a couple of options you can choose from, according to your needs and tastes. We know that our clients value customization as much as they appreciate quality, so we have taken our time to select the best gutter system installation options. We can offer you a “5 Continuous Gutters Seamless system that comes in a variety of colours and will run the perimeter of your house. This system is a standard in the building industry, and it is efficient as well as beautiful. You can also opt for a gutter protection system that will keep your eavestrough clean, saving you effort, time and money in the process. We can also offer you high quality aluminum fascia in a variety of colours and aluminum soffit to match so that you can have a beautiful personalized home without worrying about repainting undersides and facings. If you live in Penticton, Gut-R-Dun is your best option. We don’t have the cheapest prices because we use materials of the highest quality and don’t cut corners. We have the right expertise and the passion for satisfying our clients. And because we don’t cut corners in what we do, we are confident that the gutters we install or replace benefit from an extended lifespan. We select our providers carefully because we know how important is it to you to have quality in your house and to be able to enjoy the beauty of your home. If you want experts handling your seamless gutters, then you should definitely work with us. Call for more information or to book your free, no-obligation quote at (250) 542-4492.